Only one more week of the year 2010...make it a good one!! Thanks for stopping by. I made this card using two of my favorite products, diamond dust and liquid applique`. Here is a video showing how I combined the two together. Larger tubs of diamond dust can be found at your local Michael's craft stores. Liquid applique` (that I have found) can not be bought at Michael's or JoAnn's, only JoAnn's online. Here's a quick video tutorial on how I made these paper rosettes. Enjoy! The stamps come in a 4.5" x 6" unmounted rubber stamp sheet. All the images are original drawings by Lindy herself. The stamps are deeply etched and are full of detail. If you purchase 4 or more sets you can use the code: STAMPS at check out and they will be $4 each. 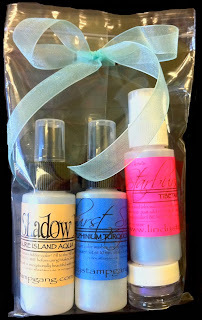 Go to this video here and comment to be entered for a chance to win a Little Lindy Kit. Also now until 12/25/10 we will be having a sale of Buy One Get One Half Off. Enter the code BOGO at check out. Here is my second wind on making Christmas cards. I wanted to use up the card pad that I was working on in my previous post. I used the same paper from Making Memories - Noel Collection. In this second batch I incorporated buttons in most of the cards. It's amazing what you can come up with when you are focused and are in the zone. There were a bit of scraps left over and I decided to make some gift tags. 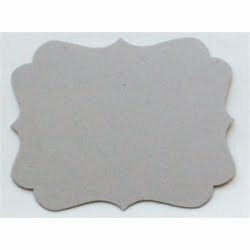 I just used a large circle punch to cut the shape from the scraps. The string is from shipping tags that I had on hand. Really easy to make and assemble. I'm actually proud of myself in using the paper that I bought and that I'm not left with any scraps that will eventually just collect dust in my stash. This was so much fun. Now I just have to decide who gets what card and mail them out. Click here to watch the video. Thanks for stopping by. Happy creating! 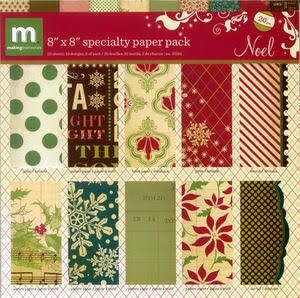 The beautiful papers I used are from Making Memories - Noel Collection. This paper was soo much fun to work with. The card base I used for all the cards, but one, is the card pad by Making Memories. These are pre-made card bases, that are pre-scored. All I had to do was add some pattern paper and a few embellies. You can watch a video of me showing the cards up close here. Hope everyone is having a great week. This is a hanging sign that I created for myself to post at my door when I am filming my YouTube videos. People who upload videos on YouTube know that the worst thing that can happen to oneself while filming a tutorial or any kind of video, is getting interrupted mid project. This is what happened to me on several occassions, and let me tell you, it's not pretty. I've already glued paper together and had already started the video and in walks my brother talking blah blah blah while I'm filming. Arghhhh! Of course the paper that I am using in my project is limited and I can't just start fresh. I had to carefully separate the pieces and start again. Well no more! LOL. This sign is suppose to stop all intruders from ever walking in unannounced and ruining my project. My sign has a vintage shabby chic feel to it. I used the Melissa Francis Chipboard Bracket as the base of my sign. I used my Lindy's Stamp Gang sprays to add the final touches to this project. Here is the video that I created to explain how I used these sprays in more detail. Thanks for taking a look. Maybe this will inspire all of you YouTube film makers to create your own sign. Hi everyone. 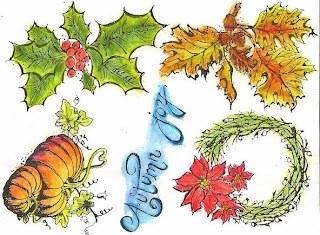 Lindy's Stamp Gang is having a one day sale today 20% off everything! There are new products and so many colors to choose from. These Little Lindy Kits make great christmas presents. Head on over there now. This sale is only good for today. 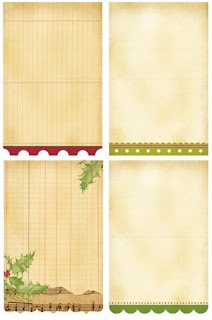 I made this for my friend Rina (you can check out her blog Scrapmusubi). 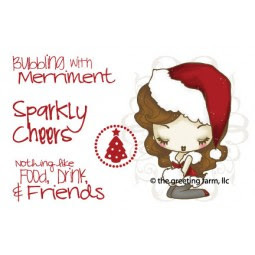 We both agreed to create something for one another using The Greeting Farm - A Cheeky Xmas stamp set. As always this was a fun little project to create. I recycled a Del Monte Sliced Peaches fruit jar, any glass jar will do. I just so happened to have an abundance of these empty peach jars (thanks Costco) on hand. Please watch the video below if you are interested in how I assembled this. Thanks for passing by and I hope everyone had a great weekend.